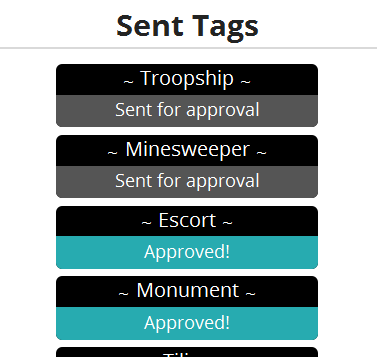 When looking at the accepted/denied tags i cant see if they are vehicle or character or whatever. So maybe its handy to add the themes they are linked to. Yes we agree the tags should show more info! We have ideas of a popup with more tag info. They should show when clicking on a tag and display thing like the original author, a description (especially for difficult words), attached topics, used piece-count and its connection-count (to how many other tags it has been connected). It should also have functionality as suggesting a new description and reports for spelling errors. The way I read it he suggests showing what topics the tags are connected to after submitting your tags. And I agree, I have had the same thought looking at my own list before. But as for the tag popup, I was thinking the other day it might be cool to allow people to submit tag tips. I think descriptions should be written in a way that they show or at least be open to multiple ways to interpret the tag, but that does not always solve those situations where you know perfectly well what the tag means, but you don't know what to do with it. Take the tag Shapeshifter, for example. That term is so commonly used in fiction it hardly needs a tag description, but it can be hard to figure out how to portray a character or creature that changes form. A tag tip could help out with that. Such a tip could be "You could draw someone of which only part of the body is transformed," or other such solutions that can be hard to think of under time pressure. The same feature could also be used for tips to avoid clichés, or other original way to interpret tags. I imagine this feature having a voting or like system, and the list being sorted based on the votes or likes. And in order to avoid people from being influenced by the tips too much I would suggest that on the initial popup you just show the amount of tips available, and only show the actual tips after the user pressed a button. That way people that are stuck with a tag can get tips when they need them, but people that are only curious about the statistics cannot be unintentionally influenced by them. Also, I think both the tag descriptions and tips should have a theme selector similar to that of tag submission. Some meanings of words are only applicable to some session themes, and they would only be distracting for themes that don't fit them. And I imagine people would give very different tips for making alien environments than for alien creatures, for example. Oh, so you mean instead of showing "Sent for approval", it should show the selected topics? I guess that's fine, as it is already in the list of "Sent tags". Tag-descriptions with specific topics sounds like a smart one! Of course it would be handy to have a "general" option in there as well. Maybe it would be cool to add a little question-mark in the top-right corner of a tag when in a session to notify that there is a description available. Tag-tips sounds cool, we never really thought about it! I do feel like this should be the task of the artist to come up with though. Even though it can be hidden behind a button, I think it'll always feel like the tip "is the there". In my opinion artists should only be able to use resources like Google to find their inspiration the same way they would for a real Concept Art job. But I'm open to hear more opinions about this topic! i more like mean, i cant see if the minesweeper is in character or vehicle or something or both/more. that was my point actually. Haha, Spencer and I can go crazy with ideas sometimes.. We'll find a way to implement it! Yeah, sorry about hijacking your thread with a long description of a completely different feature suggestion. I somehow thought it was a good place to bring it up.